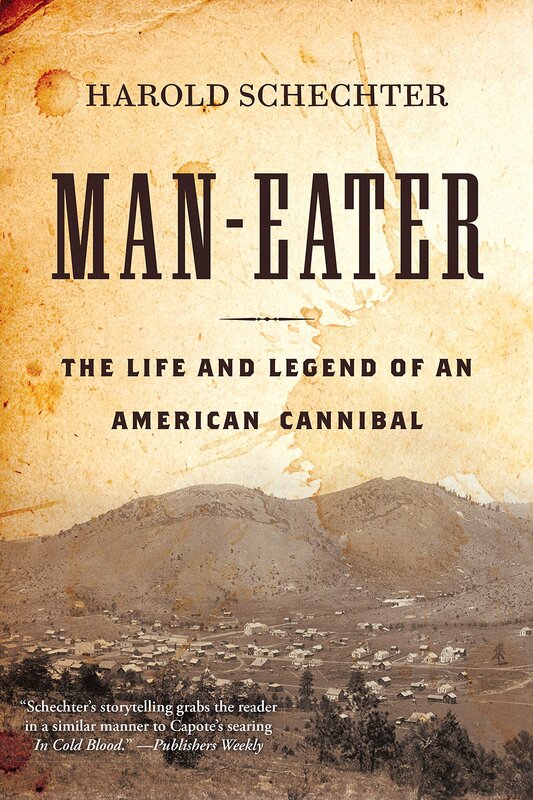 Speak of cannibalism in America and two names come to mind: the Donner Party and Alfred Packer. History has proven that, except for starvation and eating the dead, nothing untoward happened to the Donner Party. Packer is a different story, his guilt or innocence still in question 141 years after the incident. Harold Schechter seems to have answered most of the questions and adroitly separated fact from fantasy in this compelling new account. 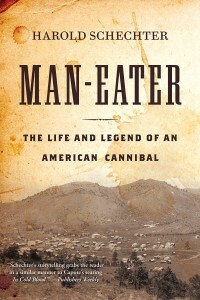 Cannibalism had long been a fact of life in the Americas. Various Indian tribes practiced anthropophagy, the eating of human flesh. Recent discoveries show that the original settlers in Jamestown, during that bleak first winter of 1610, probably resorted to eating their dead in order to survive. William Bradford, governor of the Plymouth Colony, reported the atrocities committed by the Iroquois, which included eating their captives. Skip ahead to the mid-nineteenth century. A gold rush followed by a smaller silver rush brought hordes of prospectors west to seek their fortunes. The opportunity to earn more than $1,000 per day was a siren call to many Easterners who were grossly unprepared for the rigors of life on the frontier. In the case of Alfred Packer, getting there was a battle as he suffered from severe episodes of epilepsy. Born in Pennsylvania in 1842 he was cashiered from the Union army twice for medical reasons. Drifting west and living near Salt Lake City in 1873 he saw an article about the San Juan silver mines in Southwest Colorado Territory. The one skill he possessed was lying. He claimed that he “knowed all the country” and organized a party of 21 men to seek their fortunes. The party set out in the dead of winter and were soon stranded. Ute Indians led them to a safe place and urged them to wait for spring. One group stayed and another group of five headed to a nearby cattle camp, barely arriving safely. On February 9, 1874 Parker and five others set out on a misguided death walk. The snow was deep and supplies were limited. In late March or early April a band of Utes came upon a man roasting meat over a fire and observed him throw something into the river. It turned out to be a human arm. Thus began a series of lies and changing stories. In fact, Packer confessed three times, each a slightly different version. Arrested and jailed he escaped and went missing for nine years. He was caught, tried, convicted, and sentenced to be hanged. An appeal resulted in a second trial and five manslaughter convictions. Receiving eight years for each man, he was sentenced to 40 years. This was about the same time a man got only three years for murdering his wife. There was strong support for Packer’s guilt and innocence, both of which were fueled by his conflicting statements. Friends such as Duane Hutch, whom he had befriended during his nine years on the run, worked tirelessly to free Packer from what some saw as an excessive sentence. It is a remarkable story of one man’s foolishness in causing and exacerbating his problems. After his death in 1907 he quickly “evolved into a creature of folklore and myth.” By 1928 a memorial to the five dead men was erected on the site of their death. In 1940 an absolution ritual was performed at Packer’s grave with the assistance of a goat. Various “authentic” biographies have gotten most facts blatantly wrong or twisted the truth at best. One such erroneous story impressed Dashiell Hammett so greatly that he repeated the entire piece verbatim in The Thin Man.